Extensive mapped crack on the surface of concrete structures can be a scary observation for public, or even most structural engineers. There is a common belief among material and structural engineers that the Alkali Silica Reaction (ASR) is always harmful for a concrete structure. It is scary to drive under a ASR affected bridge. Despite this observation and speculation, no major collapse has been reported as a result of ASR cracking. In this article, we will briefly review the structural effects of ASR on concrete structures. The swelling nature of ASR gel increases the chance of expansion in concrete elements. The effect of ASR on compressive strength can be minor for low expansion levels, to relatively higher degrees at larger expansion. (Swamy R.N 1986) points out that the compressive strength is not very accurate paramater to study the severity of ASR; however, the test is done because of its simplicity. Researches show that ASR cracking can significantly reduce the tensile strength of concrete; therefore reducing the flexural capacity of beams. Some research on bridge structures indicate about 85% loss of capacity as a result of ASR. The effect of ASR on elastic properties of concrete and ultrasound pulse velocity (UPV) is very similar to tensile capacity. The modulus of elasticity is shown to be more sensitive to ASR than pulse velocity. ASR reduces the load bearing capacity and the fatigue life of concrete (Ahmed T 2000). ASR enhances the shear capacity of reinforced concrete with and without shear reinforcement (Ahmed T 2000). 1- A wide range of results were reported from negligible changes to significant improves for failure load of reinforced ASR-affected reinforced beams in comparison with non-ASR affected beams. An improvement up to 1.5 times of non-ASR affected reinforced beams has been observed. Such improvements are related to a self-prestressing effect named “hogging effect”. This is because of the concrete expansion difference between the tension and compression zones. Even strength improvements in shear strength of ASR affected deep concrete beams have been reported. 2- ASR cracks provide direct paths for the penetration of severe ions into concrete such as chloride ions of deicing slats. These severe ions can speed up the corrosion of steel rebar within concrete. 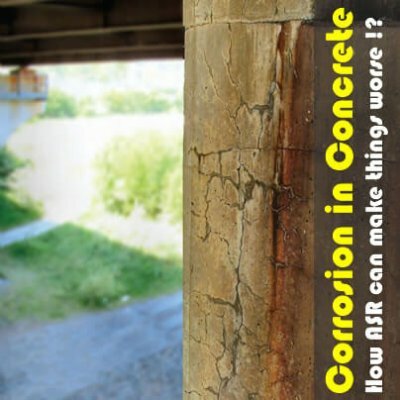 In other words, ASR cracks eliminate the protective effect of concrete cover. Despite the fact that the ASR affected reinforced elements have demonstrated no significant capacity decrease, the public safety is not compromised. 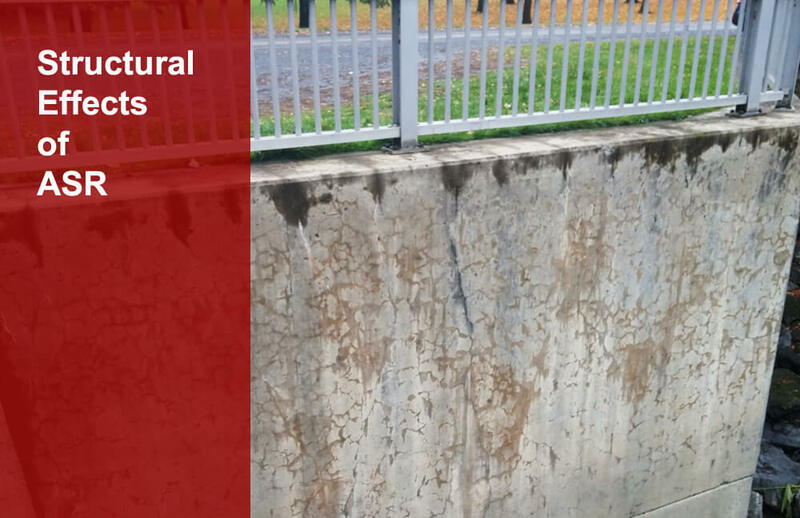 It is risky to pass under an overhead ASR affected structure because of the risk of spalling of cracked concrete. Precautionary measures should be performed to minimize such risks even though ASR can strength the structure from the structural point of view. i’m interested in the application of sealing corroded part of reinforced concrete above the roof slab of my building. Tienen ya representante técnico en Chile….? Pueden enviarme los catálogos en español?